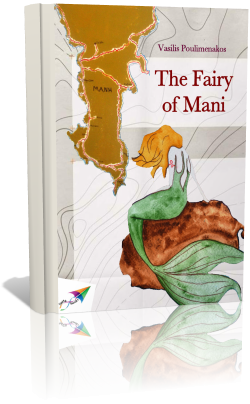 The Fairy of Mani lives in the caves of Inner Mani and Oitylo but her favourite beach is Porto Cayo, located in the southern neighbourhood of Cape Tainaron. From centuries, the summers you will find her hang about there. Sometimes she stands nailed on the tall rocks, at others she basks in Armenopetra, scanning the ships which sail timidly around Cape Maleas, and sending fortunate words and smiles. Most of the times, though, she is lost into the blue waters, transforms into mermaid, finds home in the sea bottom and saunters on the earth at nights. This book has been flying on the Internet since August 2014.